As a gifted singer and a versatile pianist with no formal training, Sara Bareilles burst onto the pop scene with a naturally skilled voice ranging from powerful and soulful to sweet and gentle, earning her instant comparisons to Fiona Apple and Norah Jones. At age 18, she left the Redwood forests of her hometown, Eureka, CA, in pursuit of the big city lights of Los Angeles. 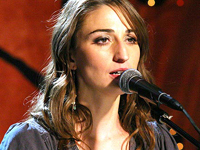 Although she attended UCLA’s Communication Studies program, Bareilles spent the majority of her spare time studying her new environment and writing poetry and songs about the busy surroundings. After graduating, she spent the next three years performing those songs at open-mike nights, slowly building her confidence as a musician before playing local venues and festivals.